This little piece will allow you to drill three 1/2" holes in your stock transmission mount crossmember, and bolt on an adapter to use your stock transmission mount itself. Very cool piece, very simple install. Drill with a half inch bit, and a couple wrenches, and an hour if you are slow! They can also be welded on if that's your preference! 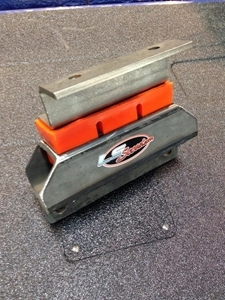 This is basically an adapter that we make in-house, allowing the use of your pre-existing TF727 automatic or T-19 manual transmission's actual rubber/polyurethane mounting pads and transmission crossmember, but placing this adapter between those components and allowing them to be bolted to the Advance Adapters brand adapter between the GM automatic and a Jeep Dana 300 transfer case. If you are using anything besides this Advance Adapter, I cannot say that this mount will work for sure. I have never tested it with a GM transfer case! We have the option for you to purchase the polyurethane mounting pads and hardware kit along with the mount adapter. Please choose if you would like us to add the poly pads or not! More power, better mileage, EFI, Overdrive, and more! All you need to fuel the LS fire! 700r4, 4L60e, etc? You need this!